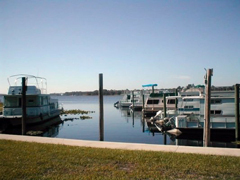 Tropical Resort & Marina Deland offers a unique visitor experience at an economical price. Our apartment-style living, situated in the heart of Old Florida on the St. Johns River, gives you the ultimate Deep South experience blended with modern amenities and relaxing activities. Some shade will do you right after a day in the sweltering Florida sun, so be sure to enjoy our covered patio amenities and solar-heated pool. After the sun goes down, Deland offers some of the best in central Florida dining. Cress, a globally inspired and James Beard Award nominated kitchen, was recently ranked as the number one restaurant in central Florida! Deland offers a lively nightlife in addition to the great eats, and is proud to include a number of fine wine and craft beer purveyors among its merchants. The Elusive Grape has been serving the developed palettes of Deland for years, and we recently welcomed craft beer manufacturer Persimmon Hollow Brewing Company to our growing ranks of local, sustainable merchants. As if the charms of downtown Deland weren’t enough, Tropical Resort & Marina has something for the adventure seeker in you, too! Experience the thrill of NASCAR and Le Mans racing at Daytona International Speedway, brave the surf of Florida’s beautiful east coast beaches, or make adaytrip to Orlando’s collection of famous theme parks. 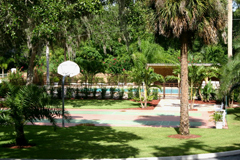 Tropical Resort & Marina is located just a short drive from all of these exhilarating activities, making it convenient for you to experience all of the fun central Florida has to offer. Even if you’re a native of Florida, Tropical Resort & Marina has something for you. We are able to host weddings, family reunions and corporate events in a picturesque outdoor setting, or you can book an apartment-style efficiency for a relaxing “stay-cation.” Spend leisurely days in the sun fishing and sightseeing on the St. Johns, or hiking the nature trails of Blue Springs State Park. We’re just out of the way enough to give that getaway feel, without the hefty pricetag. Whether you’re on the run from the cold of the Great White North, visiting a loved one at Stetson, or just looking for a home away from home to unwind, Tropical Resort & Marina would love to have you. We have a campground capable of supporting the largest of RV’s and our docks can slip boats over 30’, all at competitive daily, weekly, and monthly rates. Our location in the heart of historic Deland keeps you away from the hustle, bustle and general congestion of Orlando, but close enough to enjoy everything central Florida has to offer. From the clear, cool, waters of the numerous natural springs, to the searing blacktop and roaring engines of Daytona, there’s something for anyone who stays with us at Tropical Marina & Resort. Call 386-734-3080 to get a start booking your stay today!